Musician Mike Fox has been very busy since the last time I reviewed his work. In addition to the recent digital release of the first part of the Grim Reaper-themed Shadows and Dusk album (with part two and the complete physical release planned for next October), he’s also going to reissue his first two albums with new cover artwork! So how could I possibly resist going back to look at his first album with news like that on my mind? A door opens and a music box is heard in the beginning of “Skeletons in the Closet.” Bursts of percussion soon follow and chanting vocals also heard, with the music box occasionally getting a solo. There’s a sneaking feel at times and the wordless female vocals are an excellent touch. In “Web Spinner,” gong strikes and dark piano work meet bells. The chiming clock and male vocals both add to the overall sense of danger while the steady piano might remind you of crawling things. This goes perfectly with a clock room or any spider scene. I recommend covering a dimly lit room or hallway with fake webs and plastic spiders. Hanging spider egg sacs from the ceiling will also add to the effect, especially if you can use a hidden motor to make them jiggle slightly. A giant spider and webbed victim are definite musts. “Run!” gets the blood pumping with its speedy piano and gong strikes. It also vaguely reminds me to opening of Beetlejuice at some points. The wordless vocals, synth tones and chiming all enhance the overall mood. The gong strikes again in “Hexed.” The heavy string work and the female vocals make things especially chilling. The sounds of a heartbeat, ethereal moaning, distant booming, breathing and female screams almost make you forget about the incredibly soft music bed in “Tunnel of Nightmares.” You could just play it in a dark hallway, but I have an even better idea. Set up the exit to a room to look like the mouth of a massive monster. If you don’t want to deal with covering a chicken wire frame with papier-mâché, adapting the classic “make your house look alive for Halloween” method also works. Two costumed performers armed with fake weapons can sneak up on guests and herd them inside while shrieking about it being feeding time. The next room is very dark and decorated with red walls to represent the monster’s insides. Playing this track will add to the effect thanks to the heartbeat and breathing, while the screams and moans represent other victims. Said victims can be portrayed by props skeletons, a variation of the living wall effect or people wearing gory makeup suggesting they’re being digested. I recommend putting actors into a modified version of the “partial body on a table” effect to explain why they can’t escape with the guests. “Monster Under your Bed” features another music box tune, but it’s different from one heard in opening track. Ominous string work conveys lurking danger. The brief bursts of wordless unisex vocals and a ticking clock are also present. If your haunt has a room people walk by rather than enter, then play this in a room decorated to look like a child’s bedroom. Part of the bedspread near the floor is lifted up and some glowing eyes can be seen peering out from the darkness. You can even have a fake monster hand reaching out as well, along with a shivering prop under a blanket on top of the bed to represent a frightened child hiding under a blanket. I’ll leave it up to you whether or not you want to have a helper hidden off to the side of the door to scare viewers when they least expect it. “Chiroptera” is a reference to the classification order of mammals in which bats belong to. Its distorted tones and speedy piano work are very impressive. There’s a brief pause which soon bursts into louder volume with wordless vocals and there are some gongs and chimes as well. This creates the sense of a swarm of flying things surrounding you. In other words, it’s a must for a haunted cave or vampire’s domain. The start (and end) of “Her Epitaph” features the sound of crackling to simulate an old record playing slow, steady piano work. It’s very mournful in tone, despite the occasional use of chimes and ghostly little girl laughing. Similarly, “The Netherworld Circus” begins with merry-go-round music and an announcer telling us of a haunted circus. Things really kick up once he says title. There’s a mix of wordless vocals, wacky sound effects, creepy calliope and even a great use of drums towards the middle. “The Asylum Speaks” features a slow buildup in volume as scary strings and militaristic drumrolls play. There’s some eerie piano work, faint chimes and bursts of wordless vocals during the extra intense parts. This track offers plenty of sneaky menace and the woman laughing at the end adds to the extremely moody closing. “Massacre 1985” is so wonderfully 80’s. I love those synth stings and heavy tones coupled with the great drum work. It goes from slow and ominous to speedy and terrifying. The somewhat static-like backing at times also adds to the effect. If you plan on having a slasher room or any setup based on 80’s horror movie, you absolutely have to play this! “Crossing Over” has a slow, soft and heavy buildup where ghostly male vocals fade in and out. The piano, bells and occasional female vocals add so much to the effect. It also nicely leads into “The Empty Coffin.” Only this time, the vocals and bells are coupled with heavy touches and string work. The sheer amount of musical variations in the bell solo have to be heard in order to be truly appreciated. In “Lycanthropy,” a gong strike leads to a beat which will remind you of Jaws. Following this are wordless vocals, tolling bells, howling wolves and even an organ solo! Piano, guitars and outstanding drum work kick in for a surprise appearance as well. This all combines to create the sense of something sneaking and stalking. Even if you don’t have a werewolf scene in your haunted attraction, you can still use this in a haunted forest scene. Gongs and dreamy music that might remind you of a fairy tale open “Masquerade of Malice.” Despite the light piano work, the track takes on a much darker quality thanks to use of tolling bells and snippets of wordless female vocals. “Buried Alive” starts off with the sounds of rain and a cawing crow, along with dirt being shoveled. After the sudden appearance of a piano, we hear a scary musical buildup and more frantic piano work to represent someone waking up and panicking while trapped in a coffin. The ending vocals are a great touch. Synths lead up to slow and spooky piano work in “Escape from Cauldron Castle.” Gongs, chimes and very unique use of vocals join menacing strings to further set the mood. The doom-heavy opening of “Within the Wax” slowly builds up to some minor appearances by a music box before the frantic chase music starts. There’s some extremely interesting piano work on display, along with bells and female vocals. It’s a fantastic close to an equally fantastic album. Prelude to the Afterlife offers both haunt owners and Halloween enthusiasts with a wide variety of music. All tracks are long enough to allow for individual looping and this is one of those rare albums which can be played on a loop while passing out candy to trick-or-treaters without clashing with your chosen decorations. You might have to add a spooky doll and evil clown into the mix, but just about anything else can be paired with the other tracks. I’ve noticed how severed clown head props have become very popular in recent years, so you wouldn’t even have to commit to including a full clown dummy. Setting up a small haunted forest in your yard can be fun too. Just collect dead branches and stuck them into the ground along either side of the path to your front door. Make sure to drive them in deeply so there’s little risk of them toppling over. Stretching fake spider webs across said branches and mixing in dead leaves with the fake spiders makes things even more eerie. Having a haunted forest also allows you to imply that any sound effects which don’t match up with your décor are happening somewhere behind the trees. 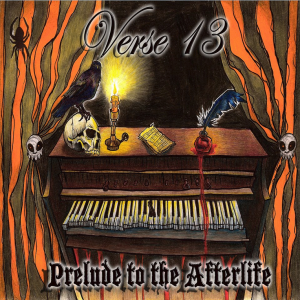 So if you’re tired of using the same scary ambience album year after year, do yourself a favor and look into the work of Verse 13. Special thanks to Verse 13 for use of the image!